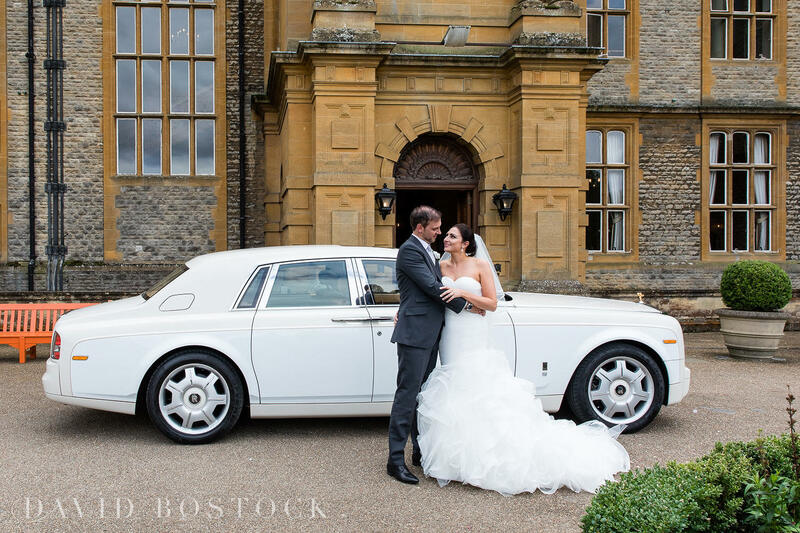 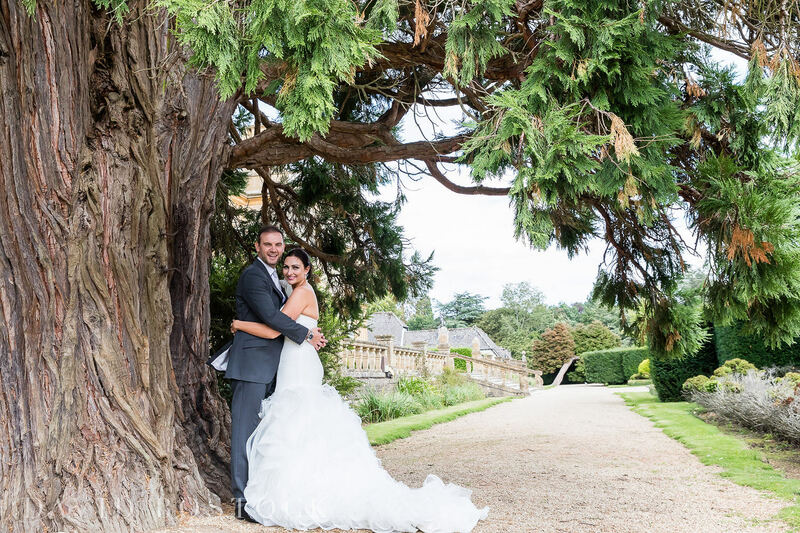 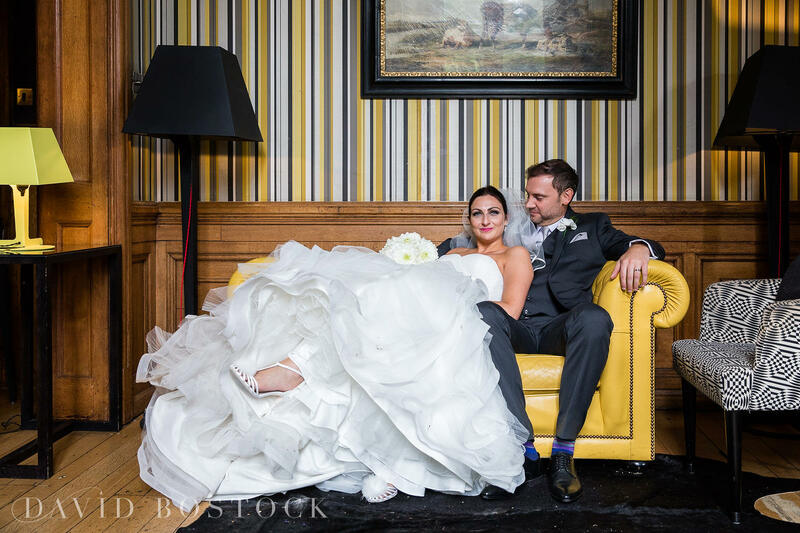 The stunning Eynsham Hall was the perfect venue for the fabulous summer wedding of Freyja and Anthony. 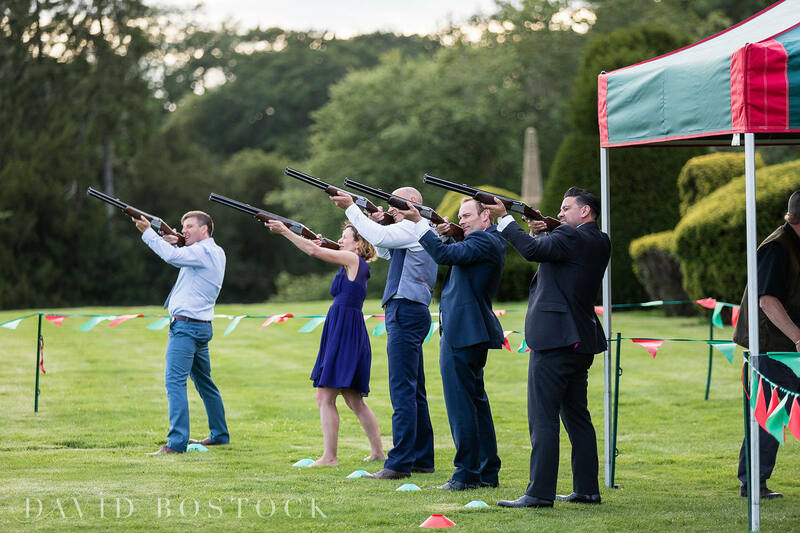 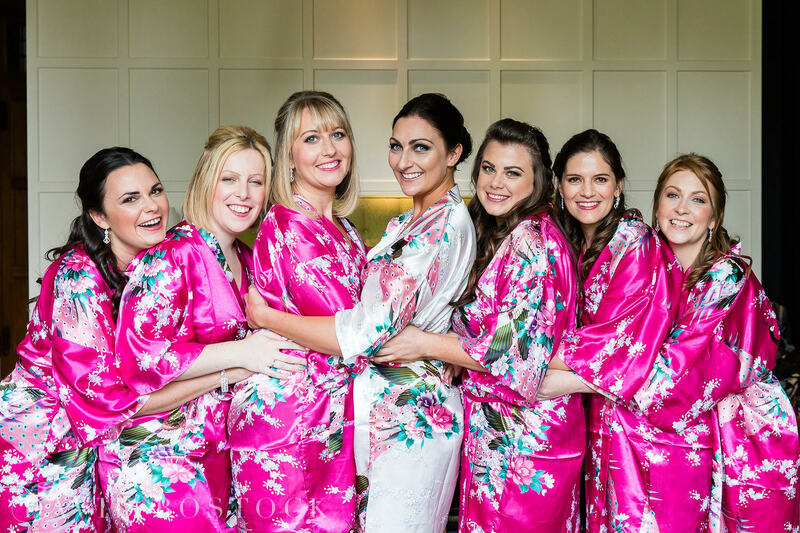 Packed with personal touches, and even a spot of laser clay pigeon shooting, this stylish August wedding was one to remember! 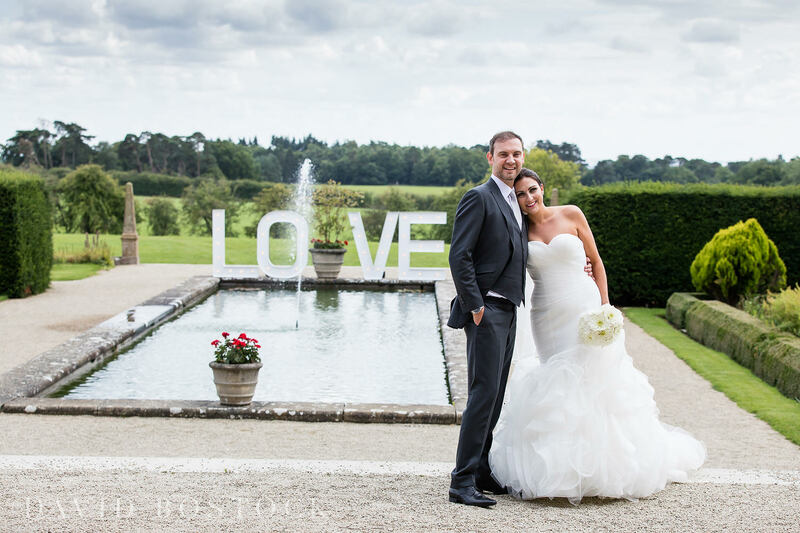 Set in 3,000 acres of beautiful Oxfordshire parkland, Eynsham Hall is a knock-out venue for a seriously luxurious wedding. 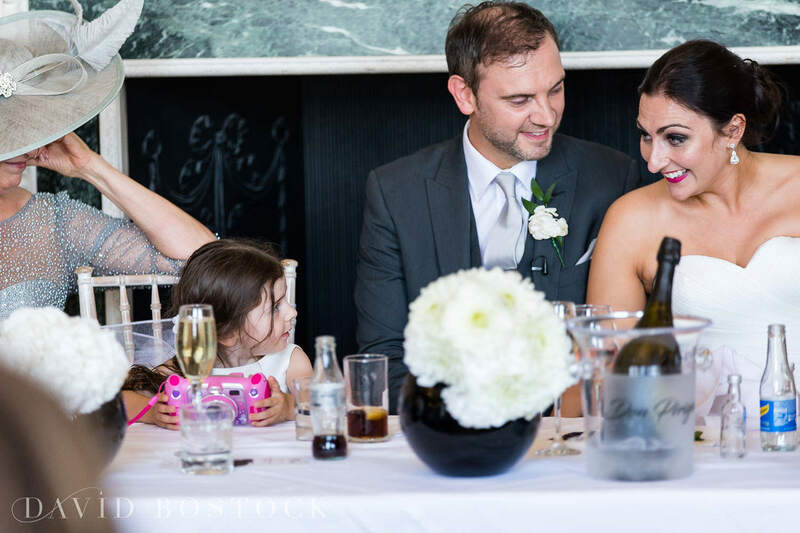 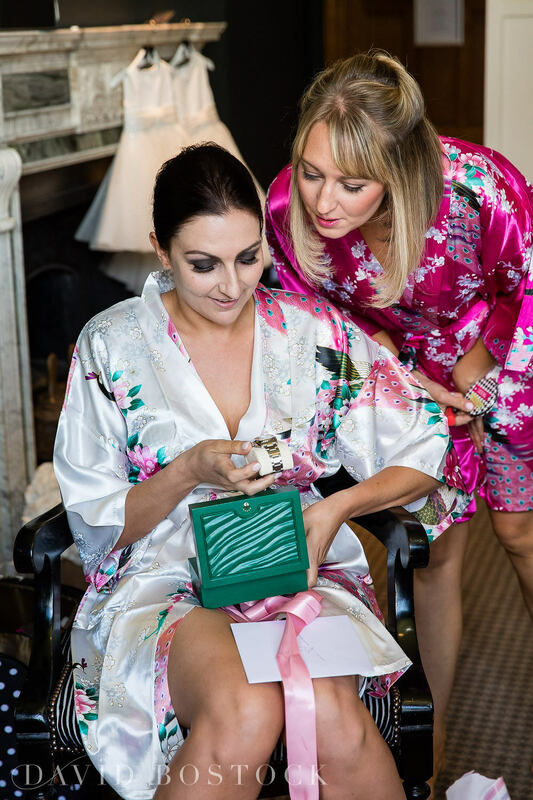 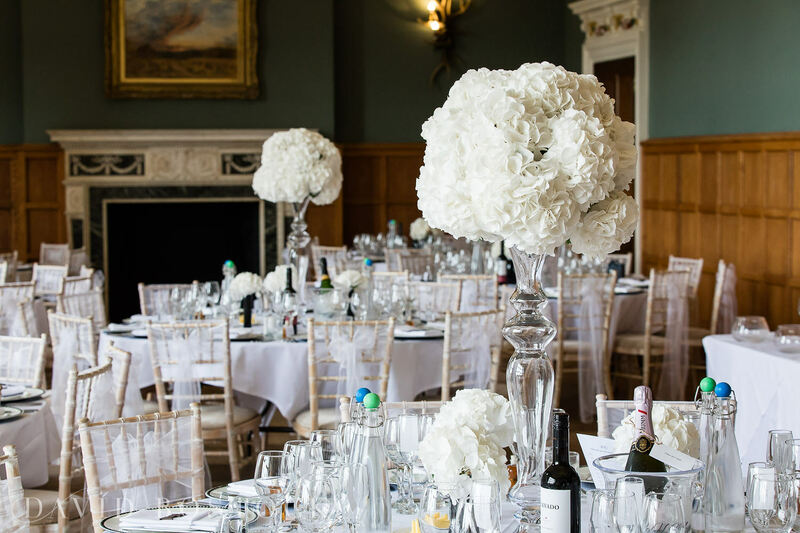 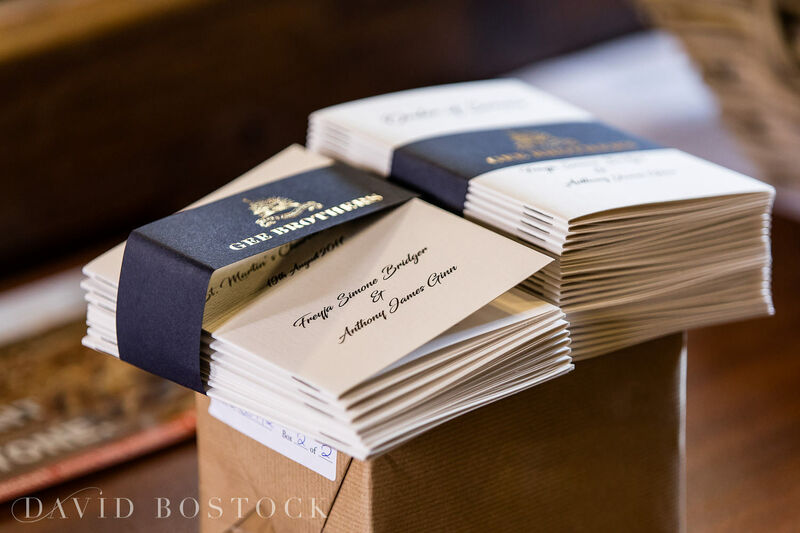 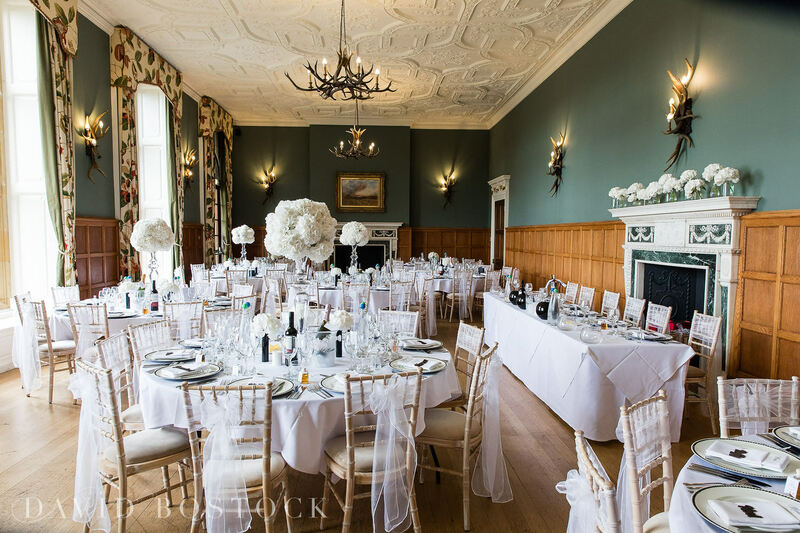 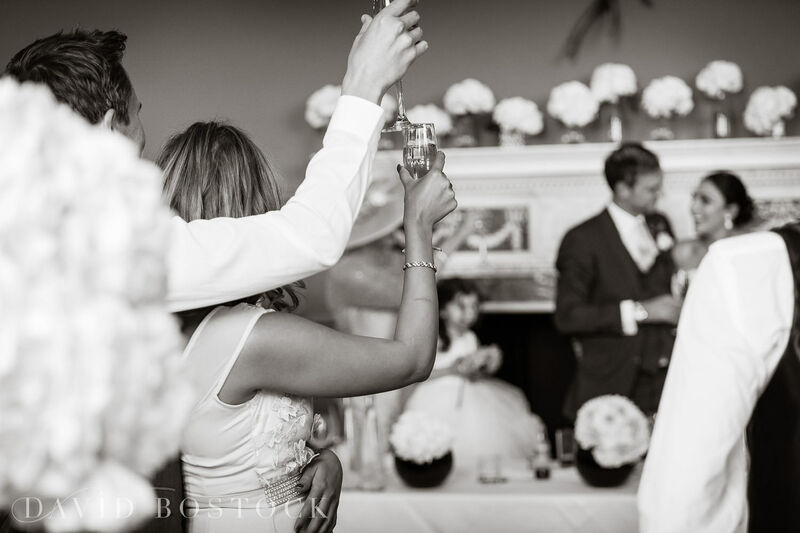 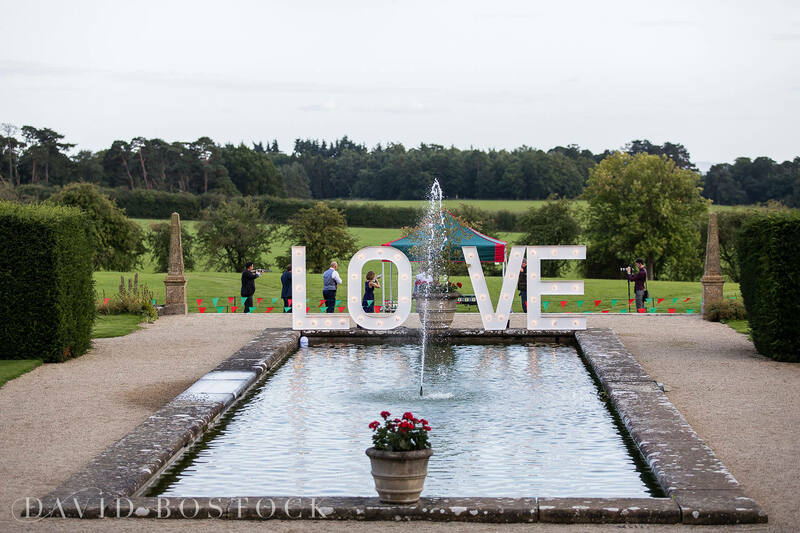 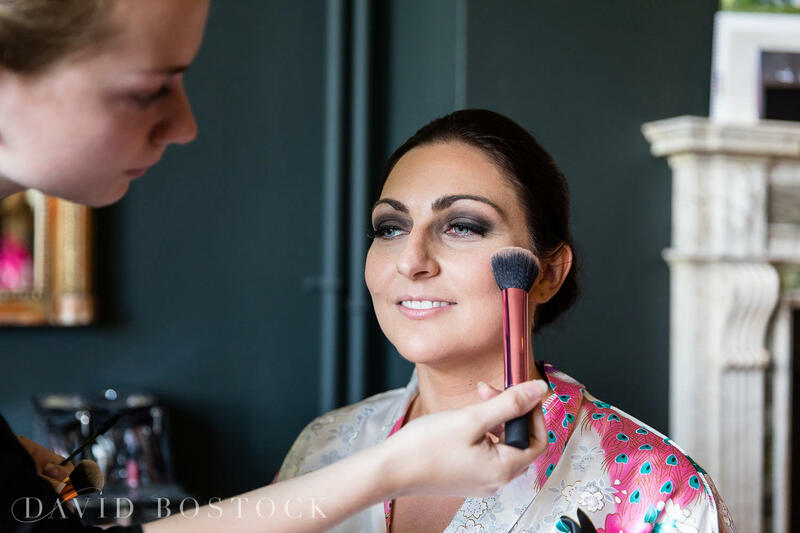 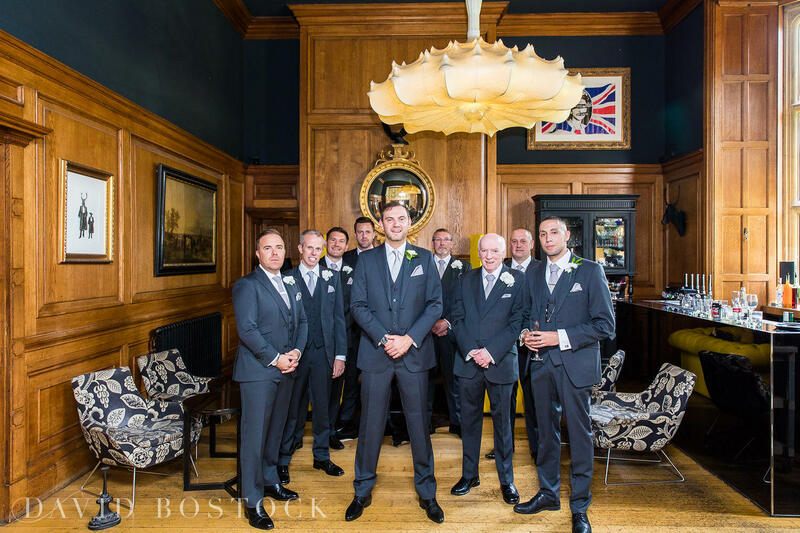 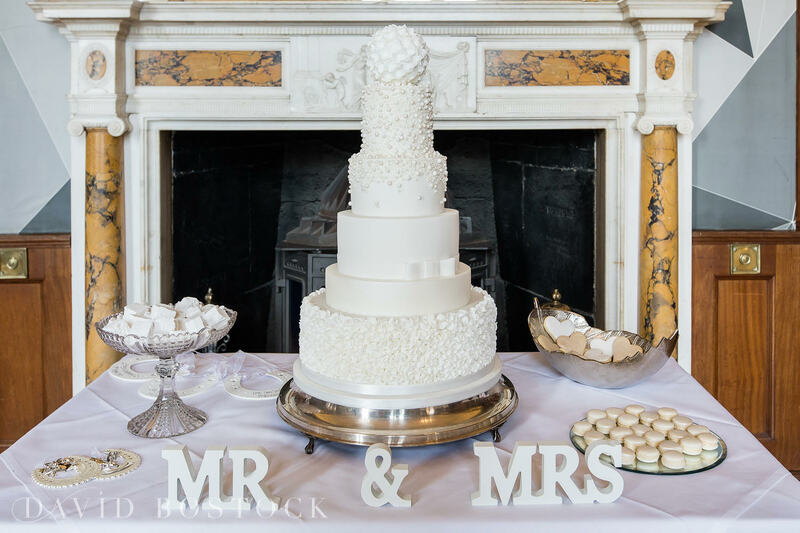 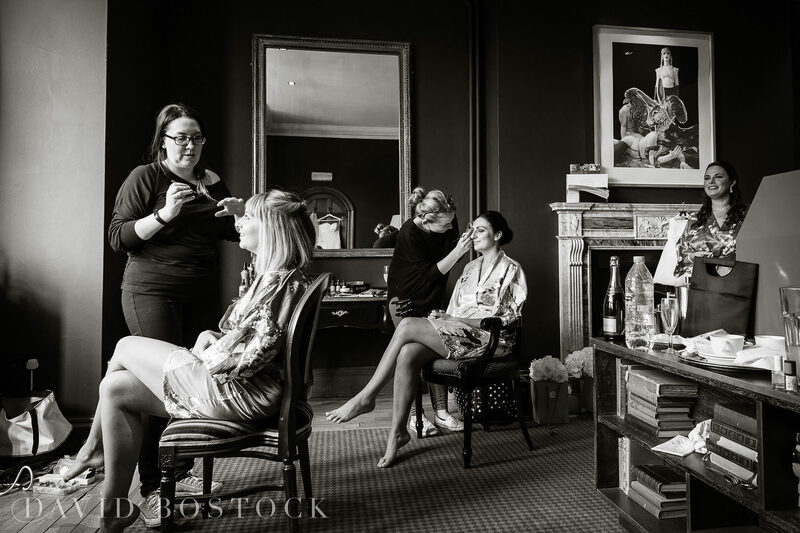 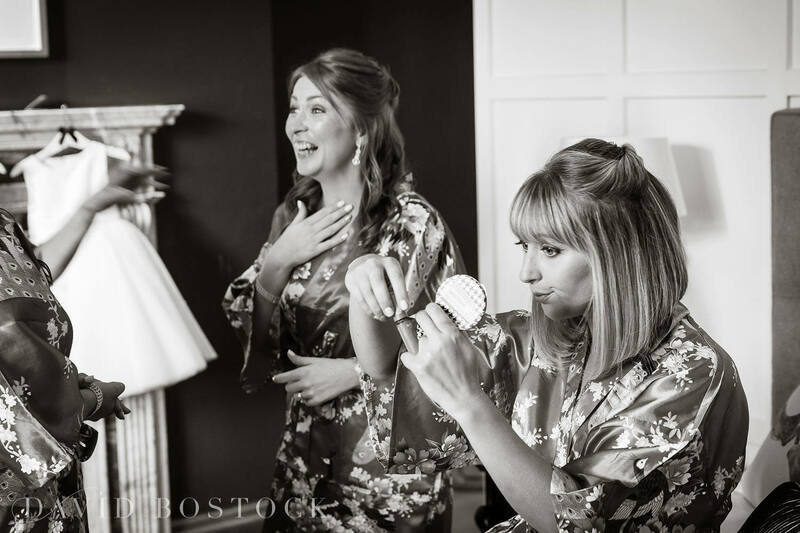 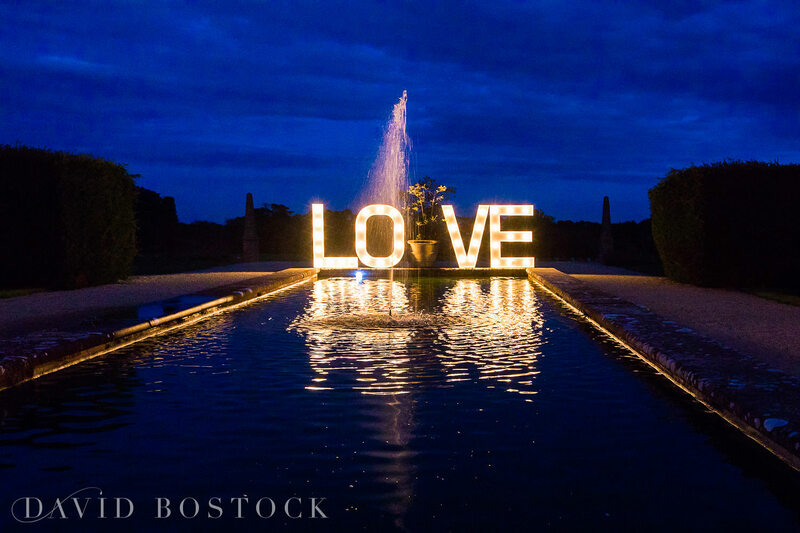 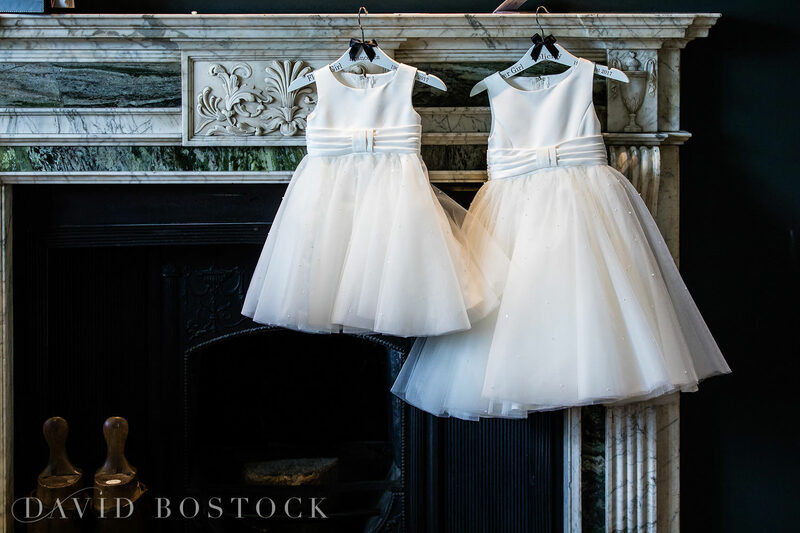 The Jacobean-style Grade II listed mansion manages to mix a grand country house style with a welcoming and informal feel, and the team go out of their way to make each wedding totally bespoke to the couple. 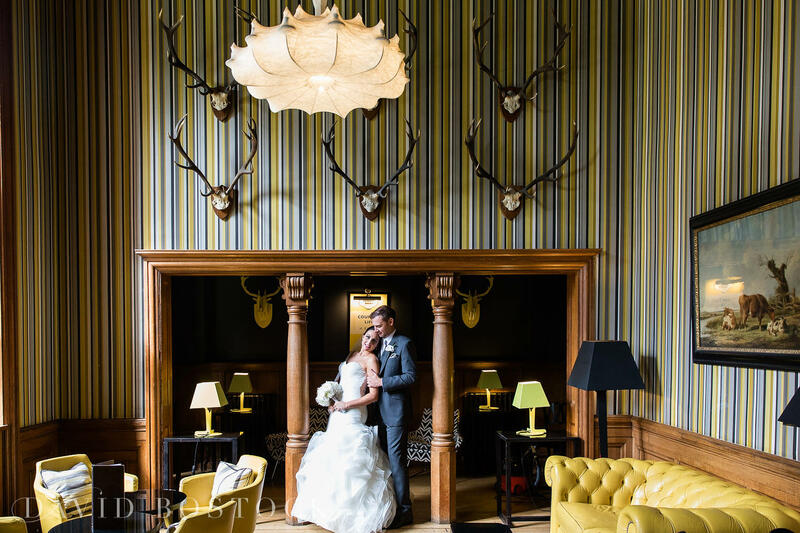 Freyja and Anthony went for exclusive-use, so they got the whole of Eynsham Hall to themselves for the day, which gave them the freedom to really put their stamp on the place. 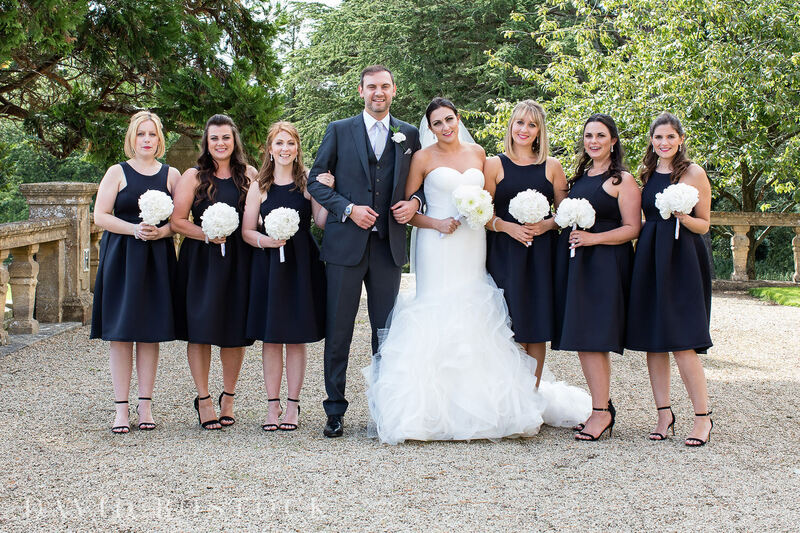 From the traditional exterior to the pristine gardens, I was spoilt for choice when it came to amazing places to photograph the wedding party. 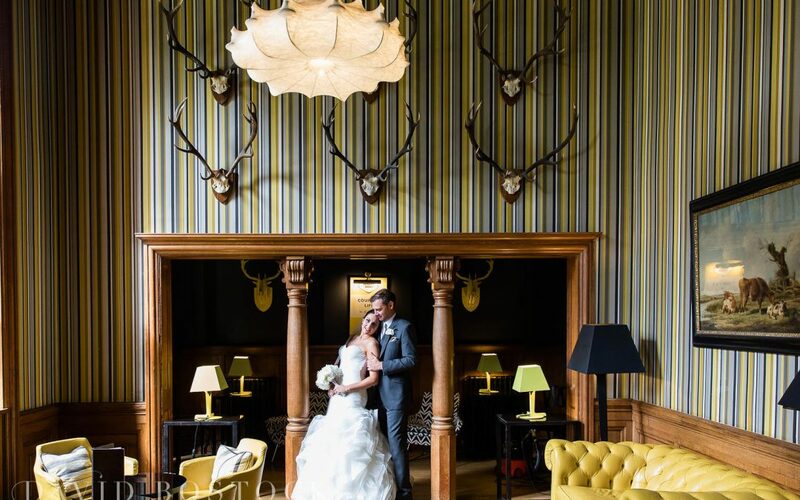 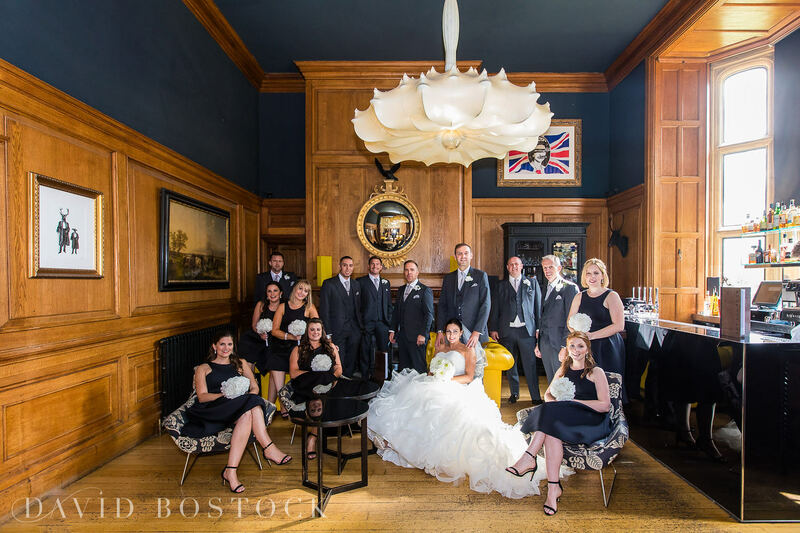 The dramatic yellow and black Gun Room bar, in particular, made a really striking, sleek and modern backdrop for some great bride and groom photos. 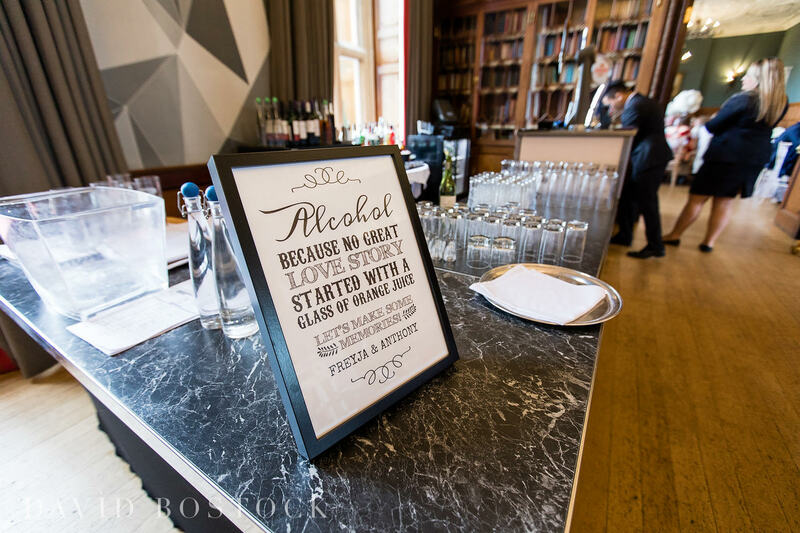 That is one very cool bar! 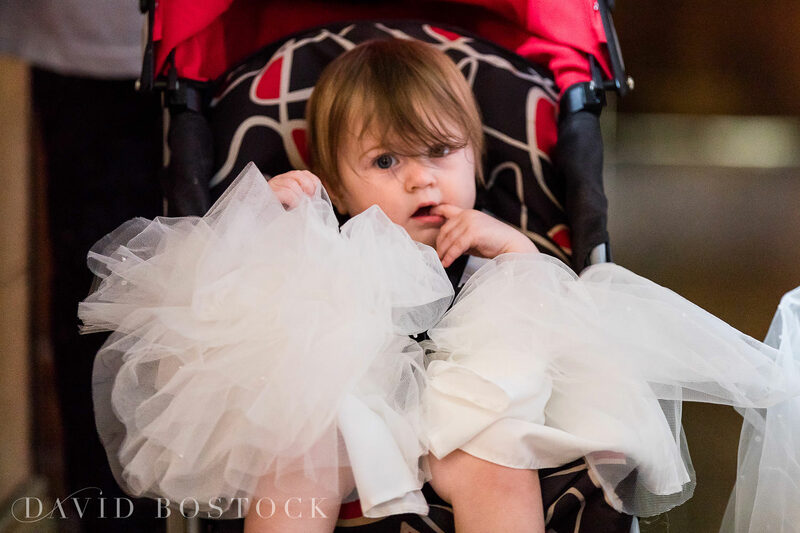 Freyja went for an old-school Hollywood look, in a glamorous strapless dress with a sweetheart neckline and dramatic ruffled fishtail skirt. 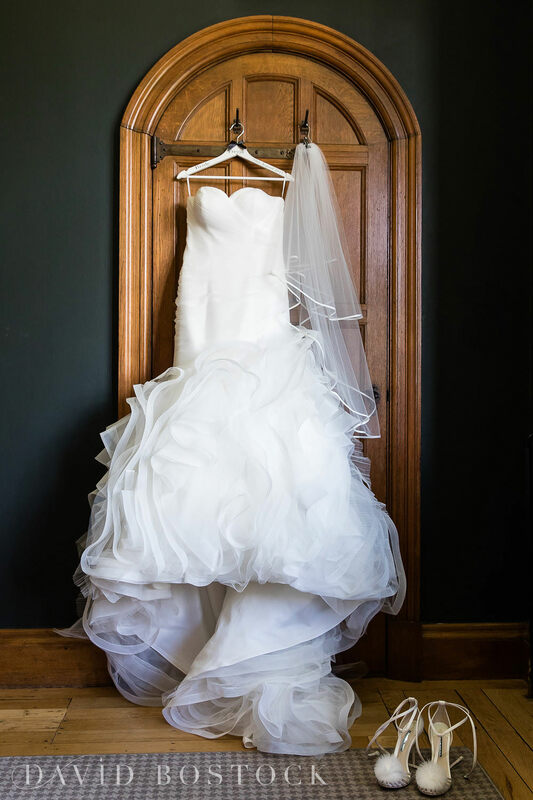 She teamed this with a chic up-do, smokey eye and simple white dahlia bouquet for a real Oscar-worthy bridal look! 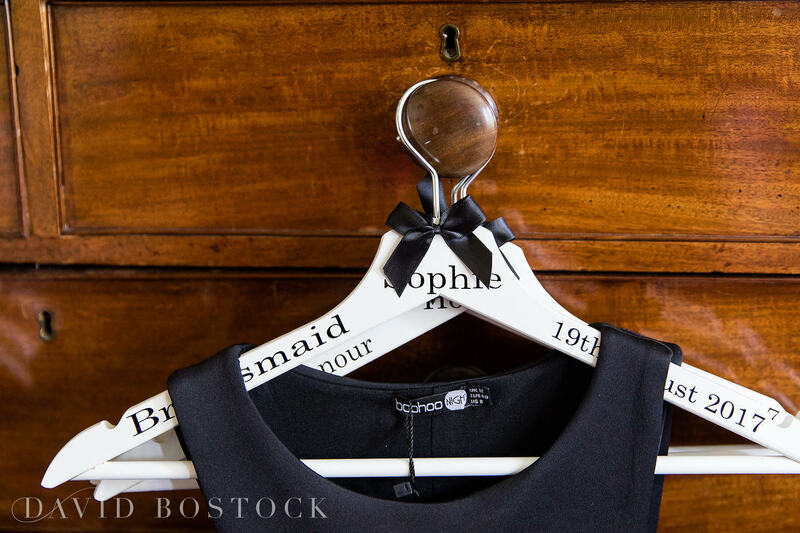 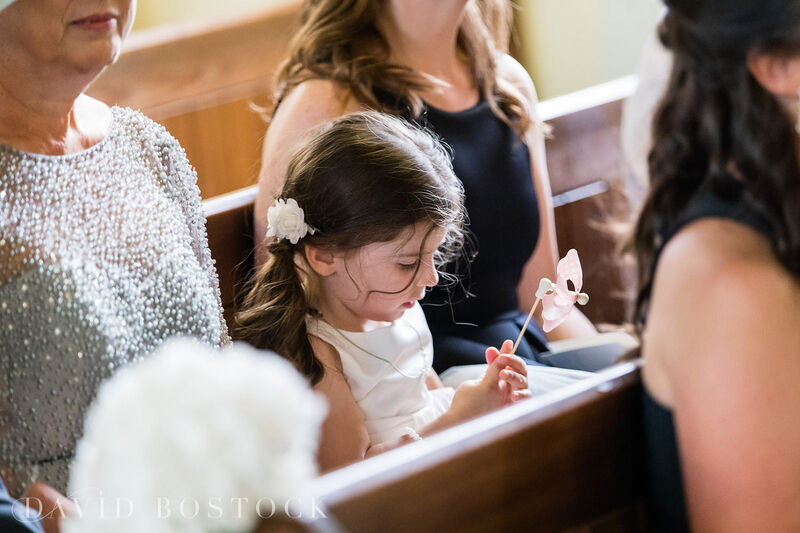 The bridesmaids wore watching knee-length black dresses, while the couple’s daughter, Chesca, looked adorable as flower girl in her pretty tulle dress. 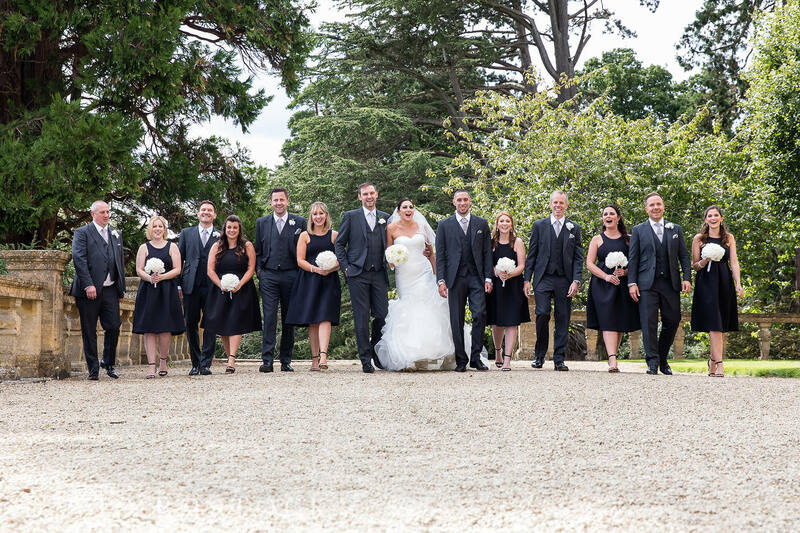 The whole monochrome colour-scheme really added to the classy feel of the day and everyone looked fantastic. 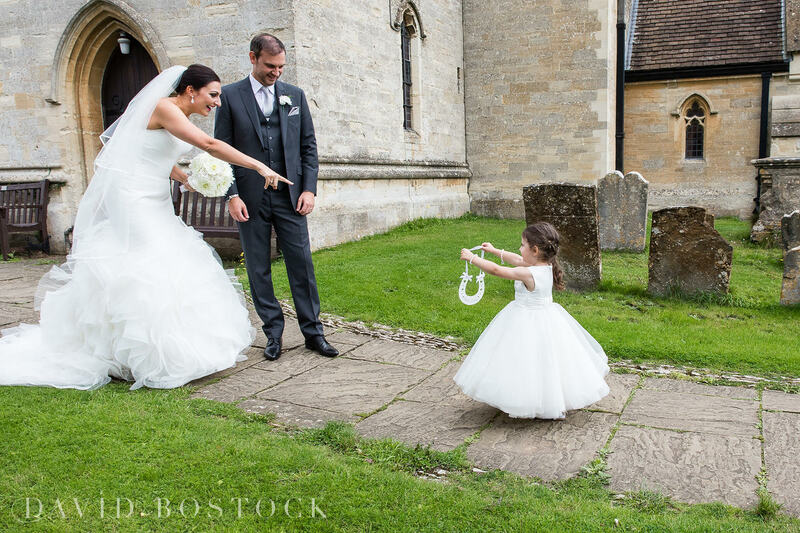 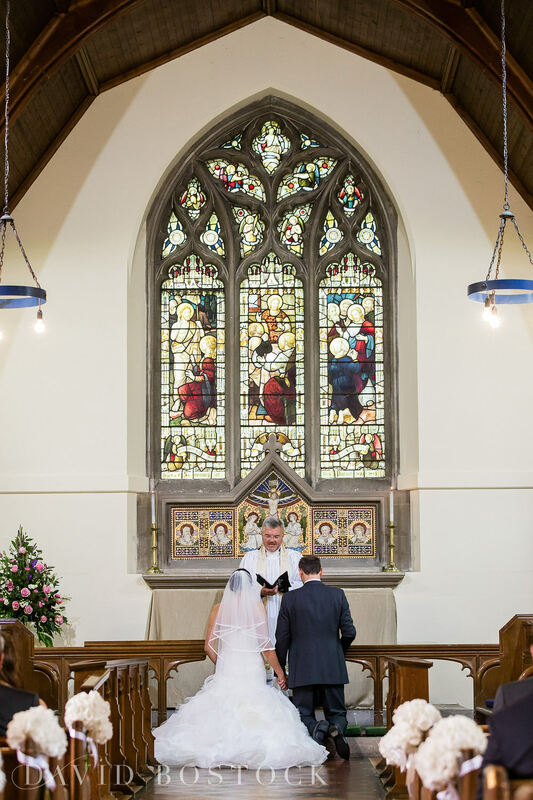 The couple married at the picturesque St Martin’s Church, Bladon in Oxfordshire, just a 10-minute drive from Eynsham Hall. 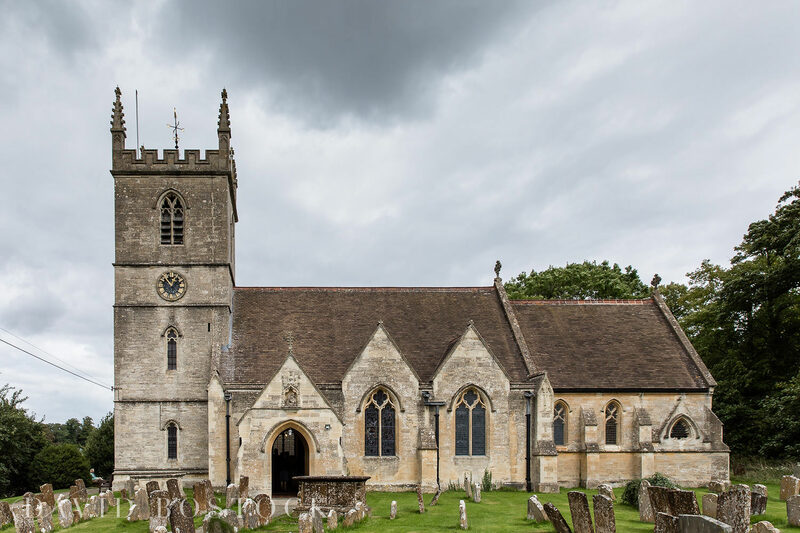 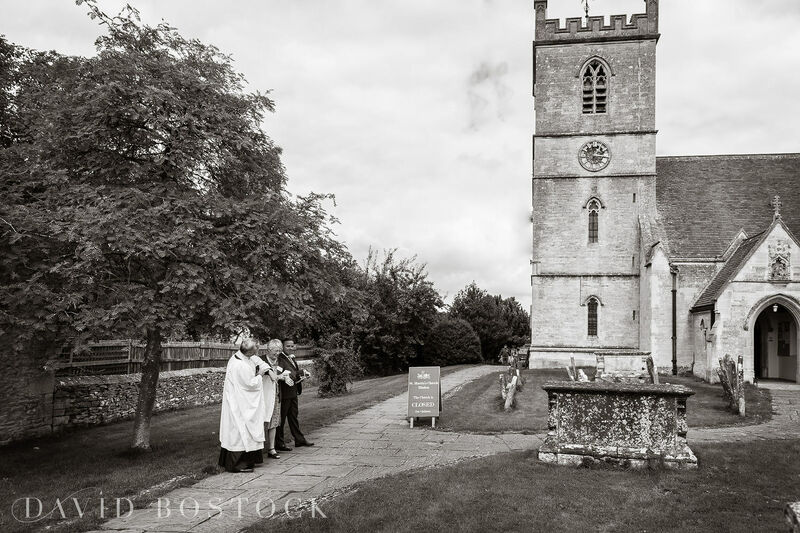 The church is your traditional, quintessentially English parish church – very Four Weddings and a Funeral – and is famous for being the burial place for Sir Winston Churchill. 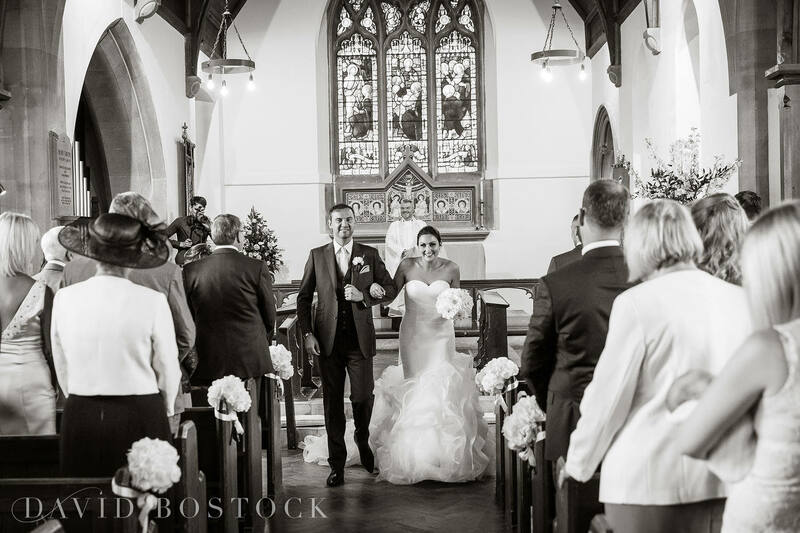 The day started off in dramatic fashion, as Anthony, the groom, was really late arriving at the church, due to a mix-up with transport. 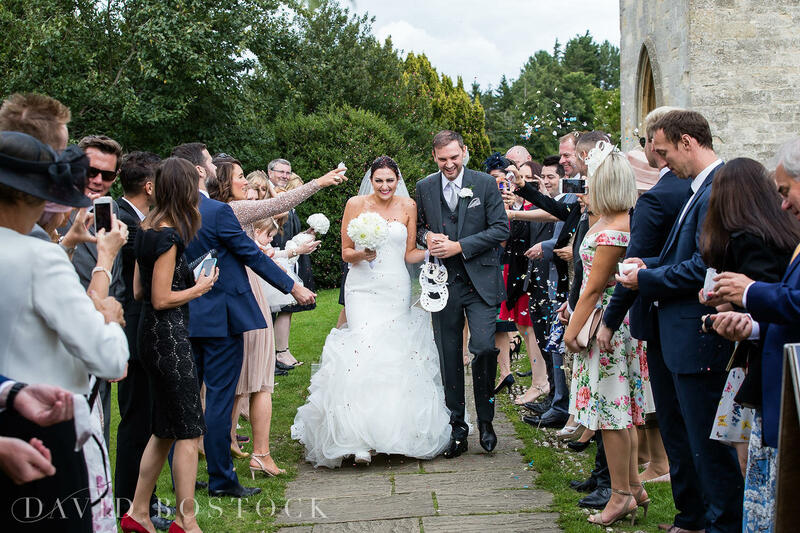 Now, I’m used to the bride turning up late, but this was a new one for me, with Anthony arriving after most of the guests and just a few minutes before his bride. 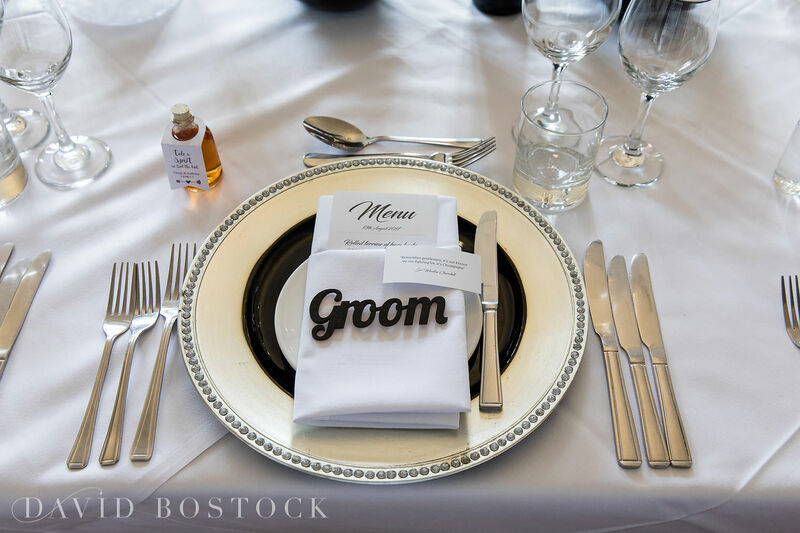 Talk about cutting it fine! 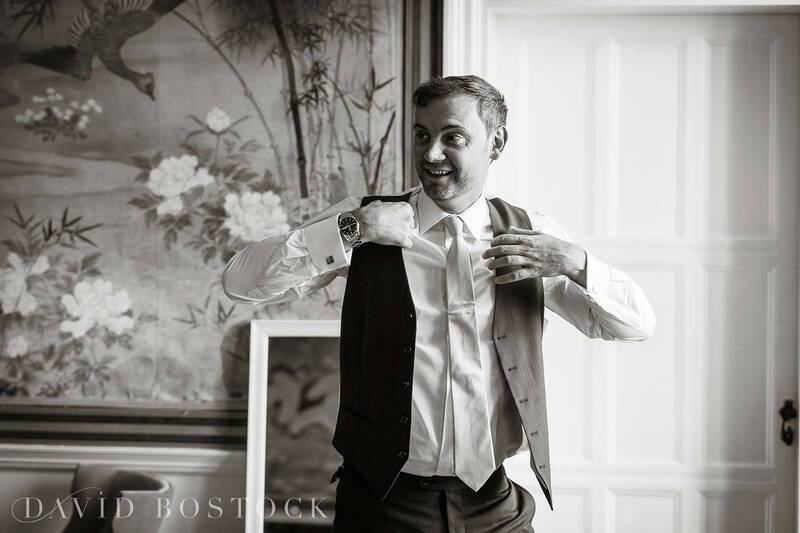 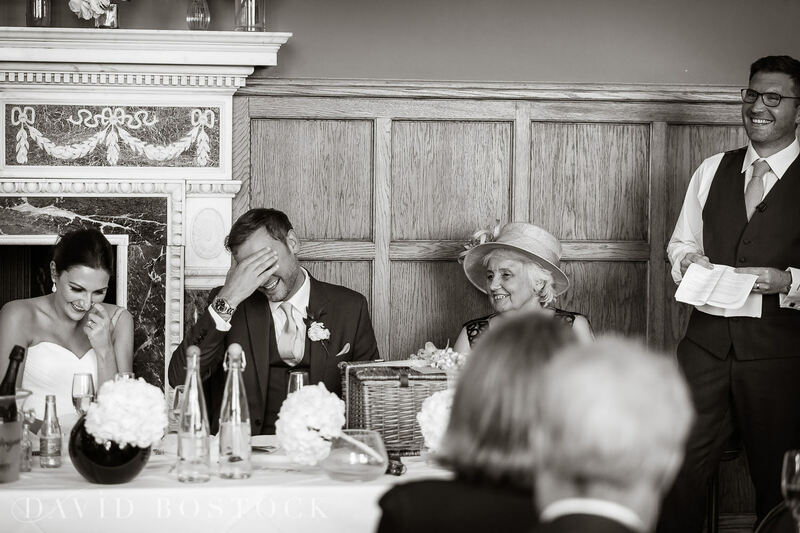 I managed to get a great shot of the vicar looking at his watch as he waits for the groom to arrive – I don’t think Anthony will ever live that one down. 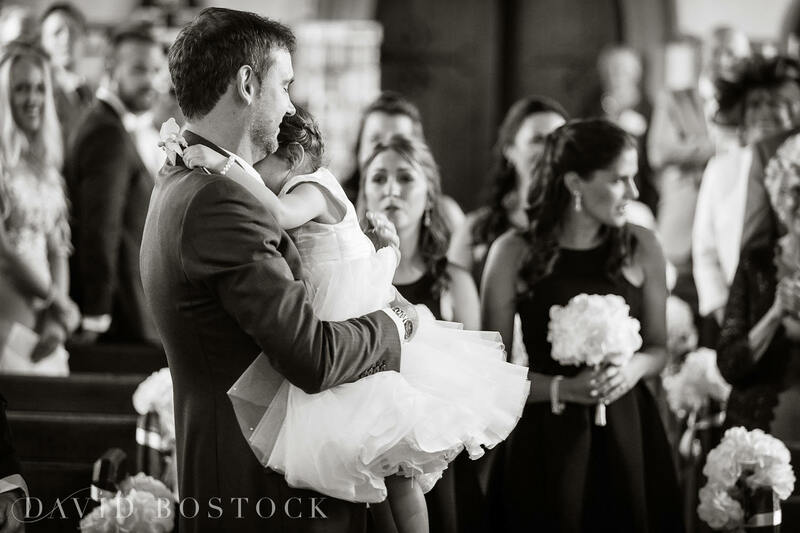 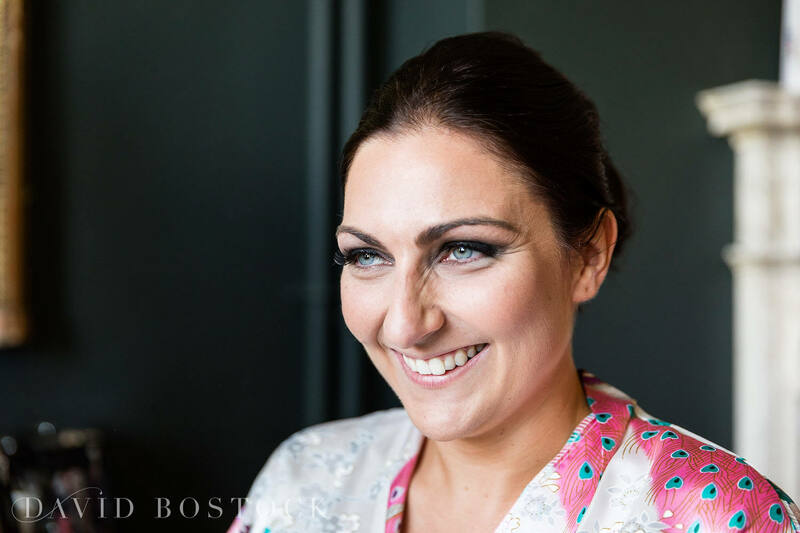 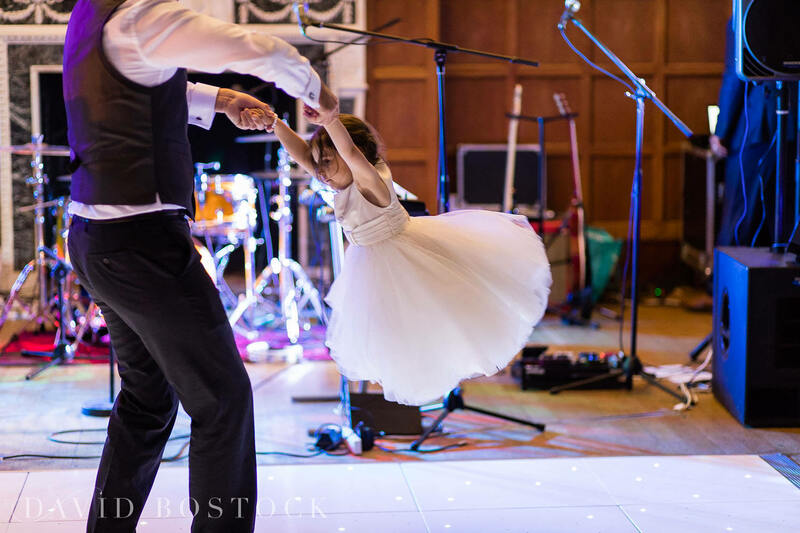 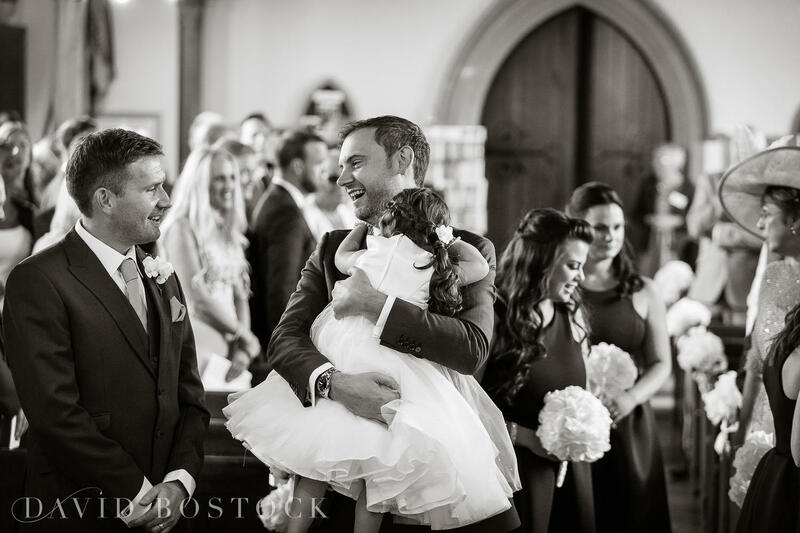 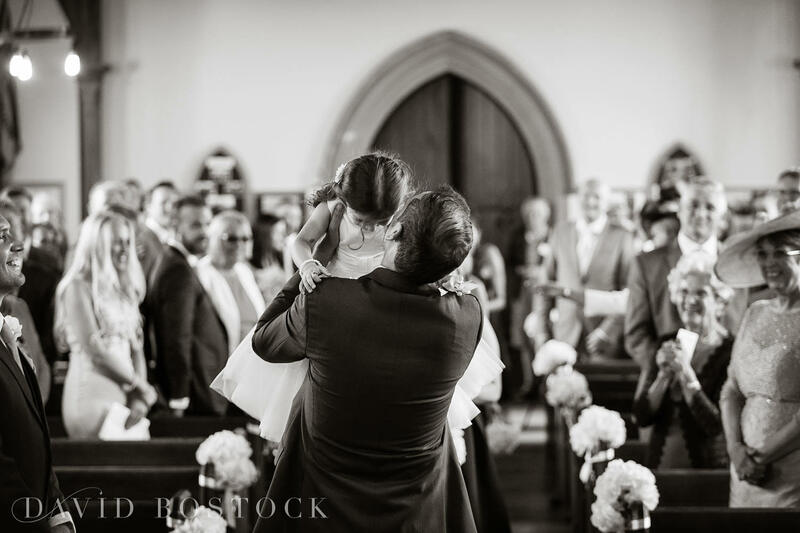 Thankfully, after that the ceremony went without a hitch – one of my favourite moments being when the couple’s daughter, Chesca, spotted Anthony at the alter and ran down the aisle, shouting “Daddy! 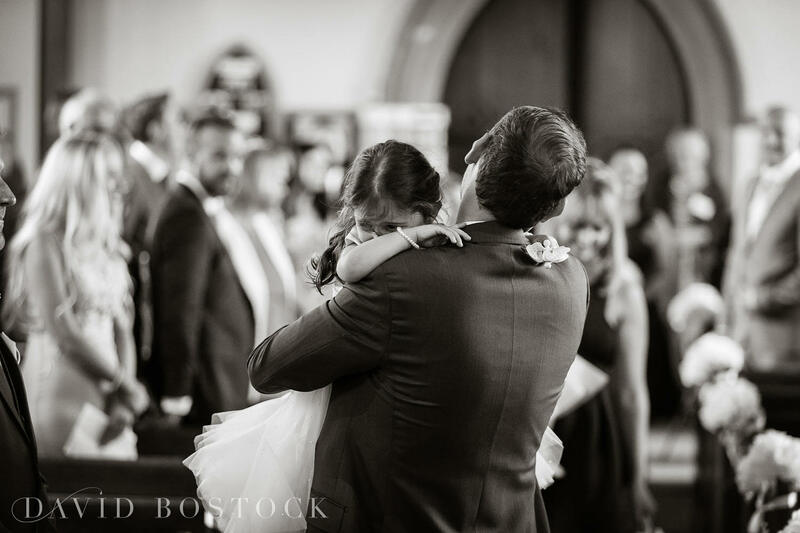 Daddy!” as she leapt into his arms. 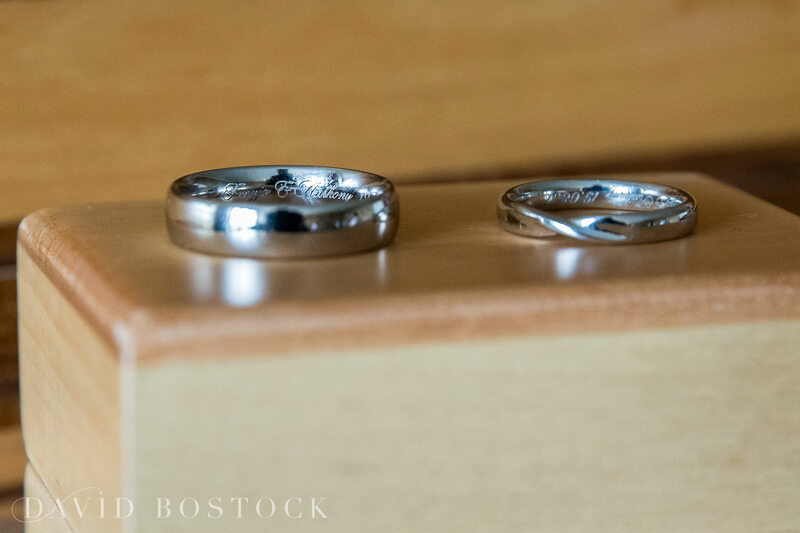 I also caught this camera, and absolutely love the shots. 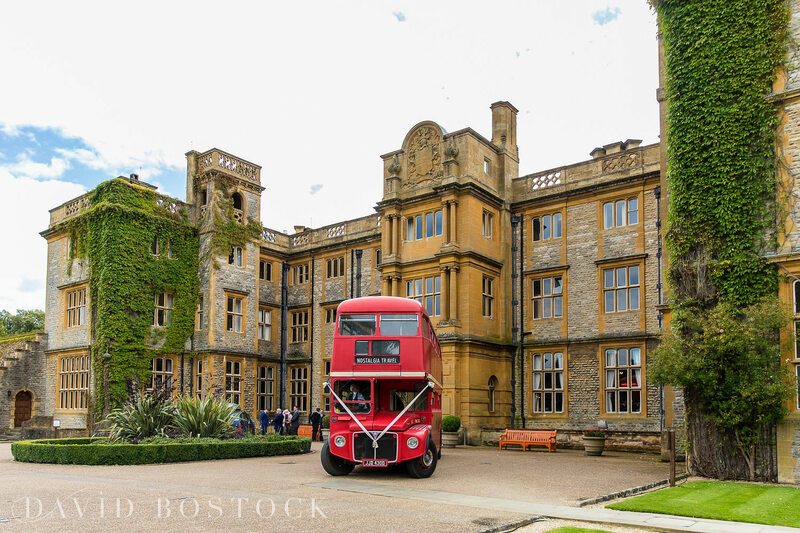 The wedding guests were all transported to Eynsham Hall in a very cool old-fashioned double-decker red bus, then milled around outside, taking in the gorgeous views over a glass – or two – of champagne. 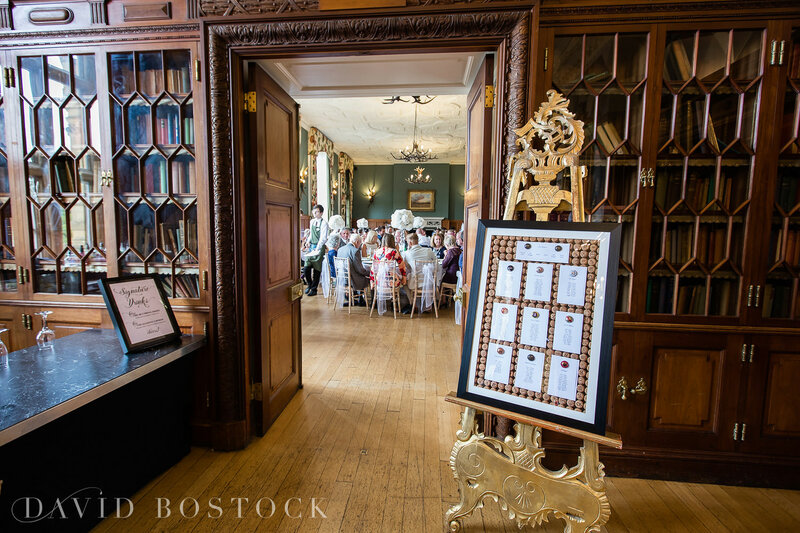 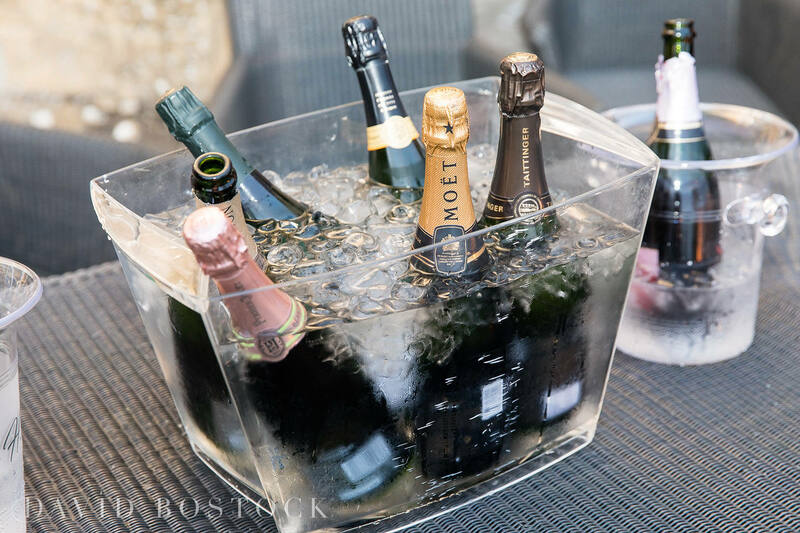 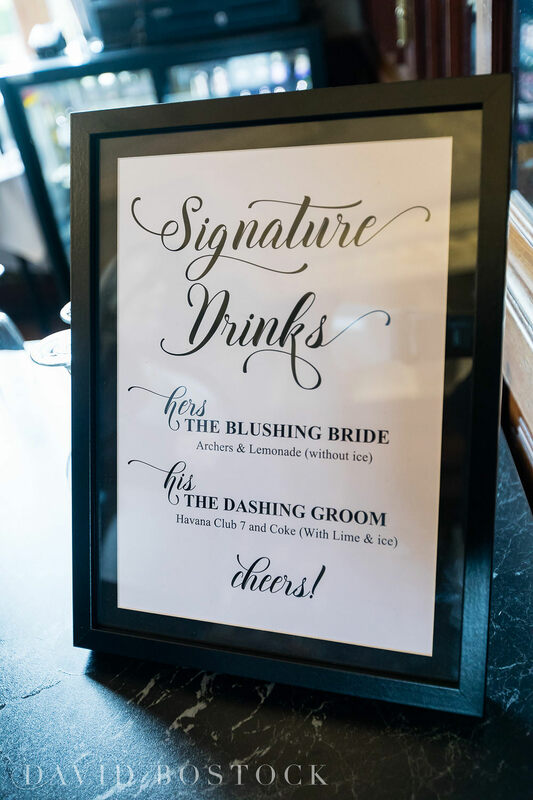 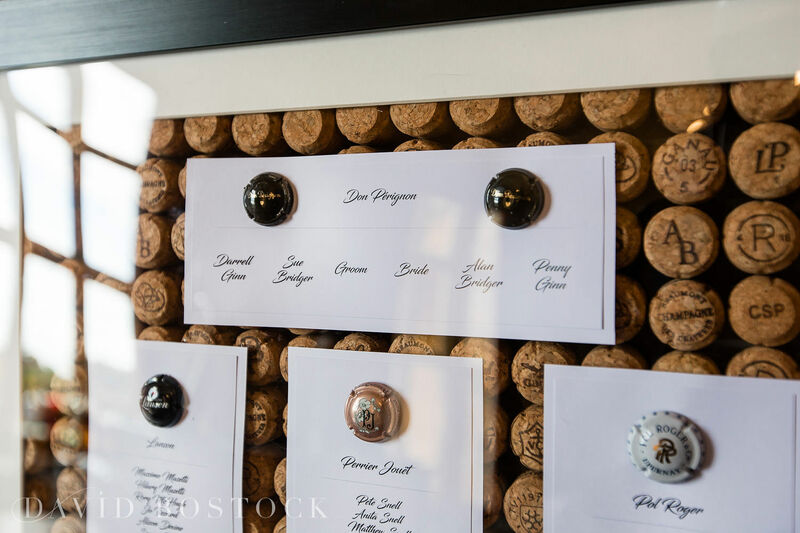 The couple showed their love for the finer things in life with tables named after their favourite brands of luxury champagne, as well as an original seating plan made up of a LOT of champagne corks! 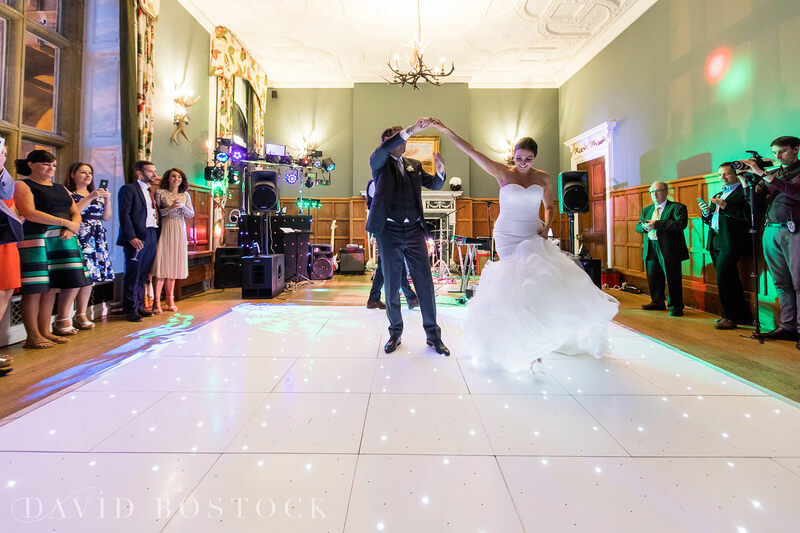 A delicious three-course meal followed, before the guests took to the dancefloor to dance the night away. 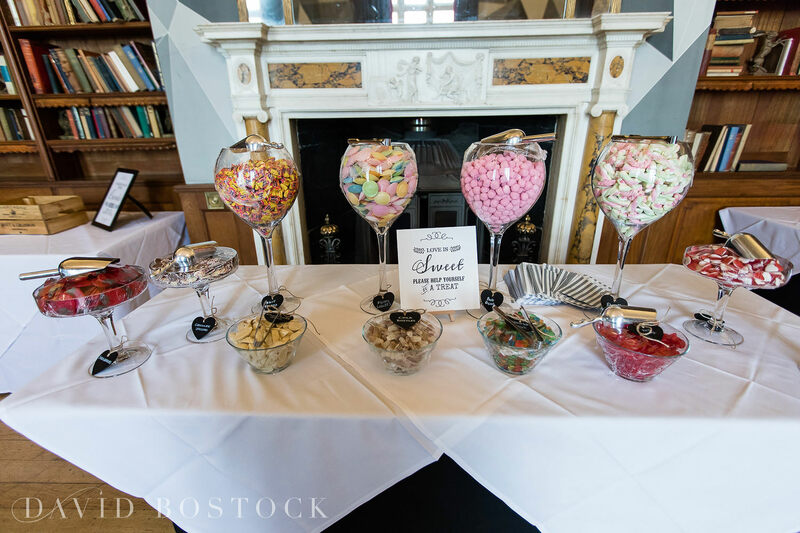 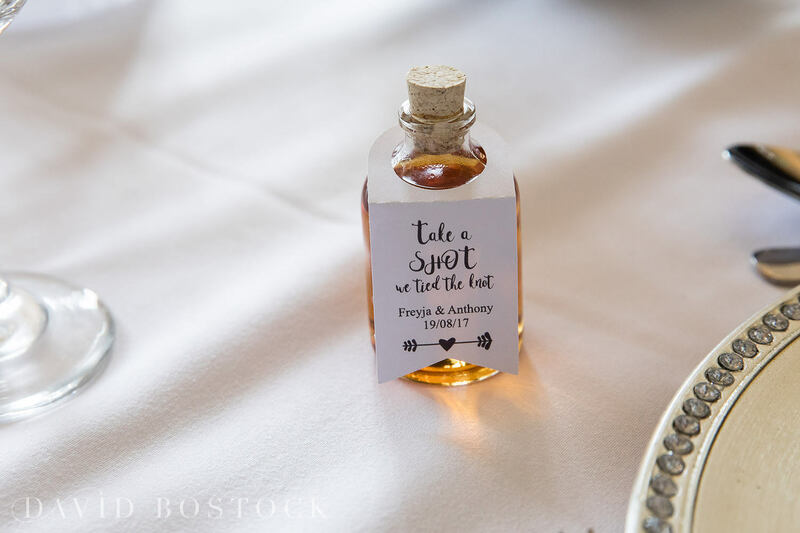 Freyja and Anthony added lots of personal touches to their day, including a fun pick ‘n’ mix sweetie table where guests could help themselves, mini bottles of shots as favours, oversized, light-up letters spelling out LOVE and signature ‘his’ and ‘her’s’ cocktails. 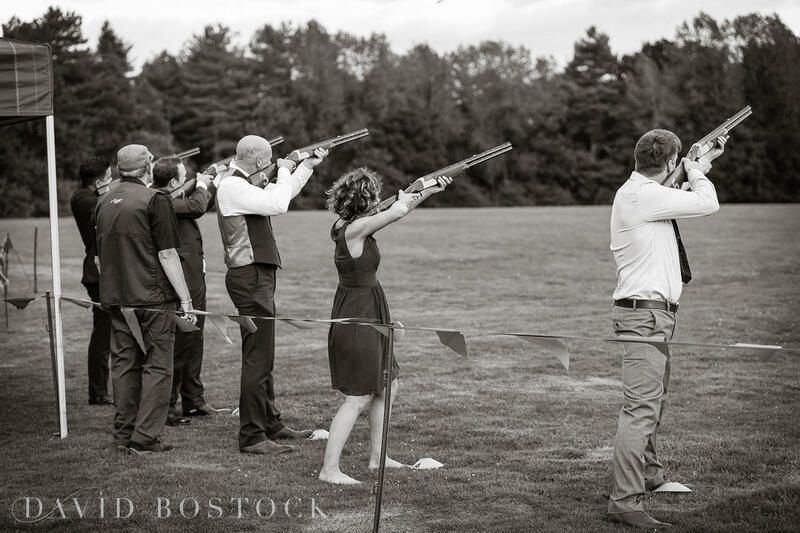 They even laid on laser clay pigeon shooting for everyone – which, as I seem to remember, got very competitive! 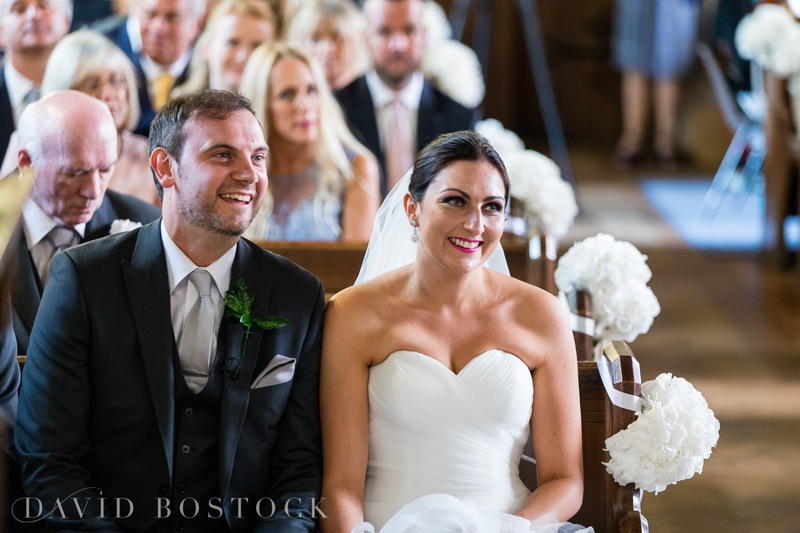 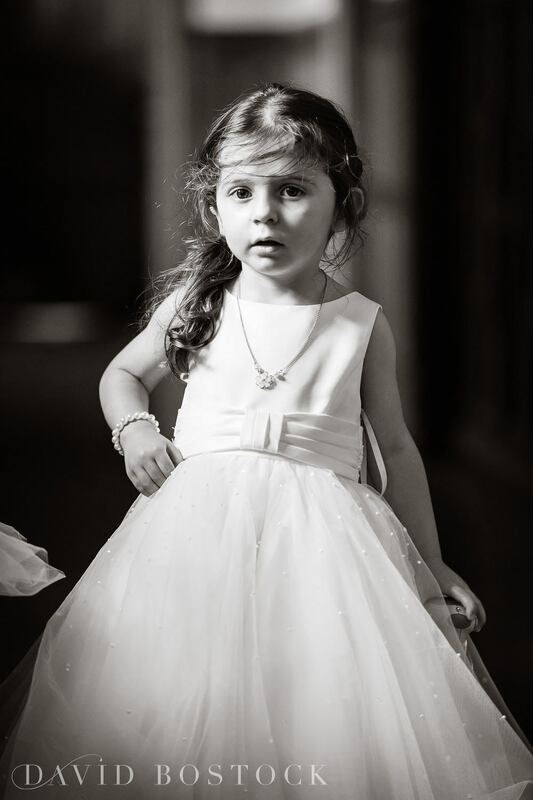 It was a fantastic wedding to photograph, full of family, friends and fun. 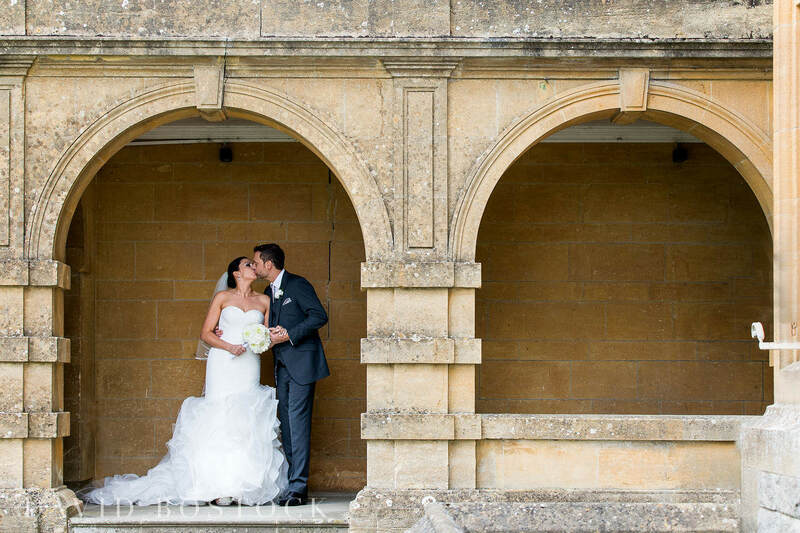 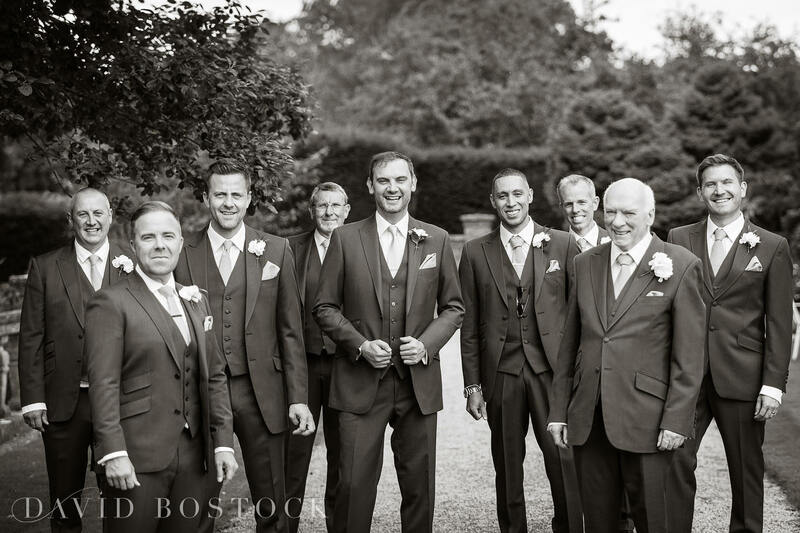 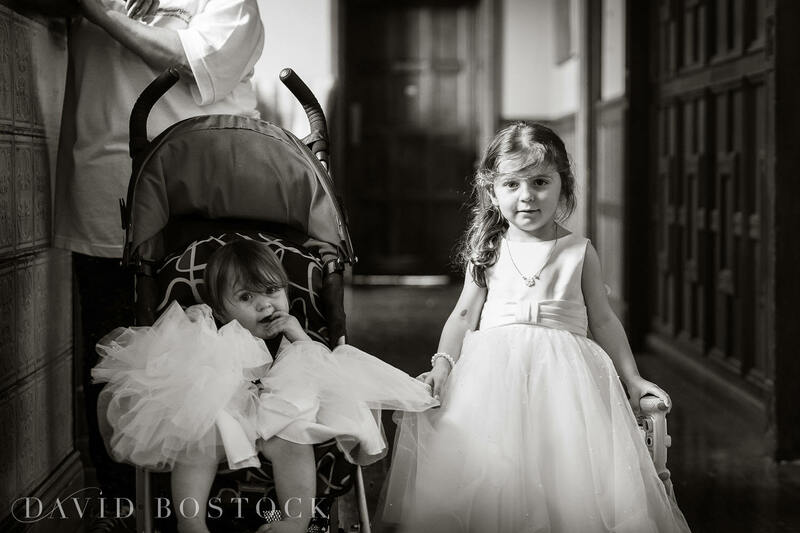 Check out more Eynsham Hall weddings on my blog. 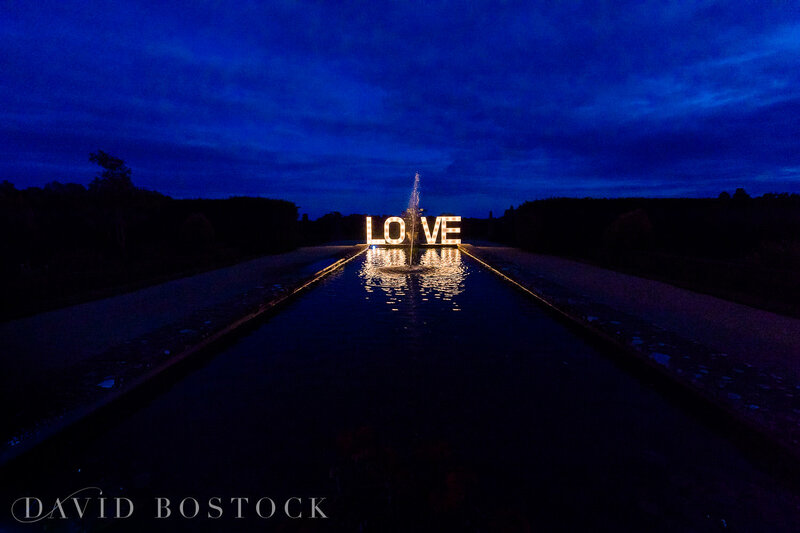 Absolutely stunning work David. 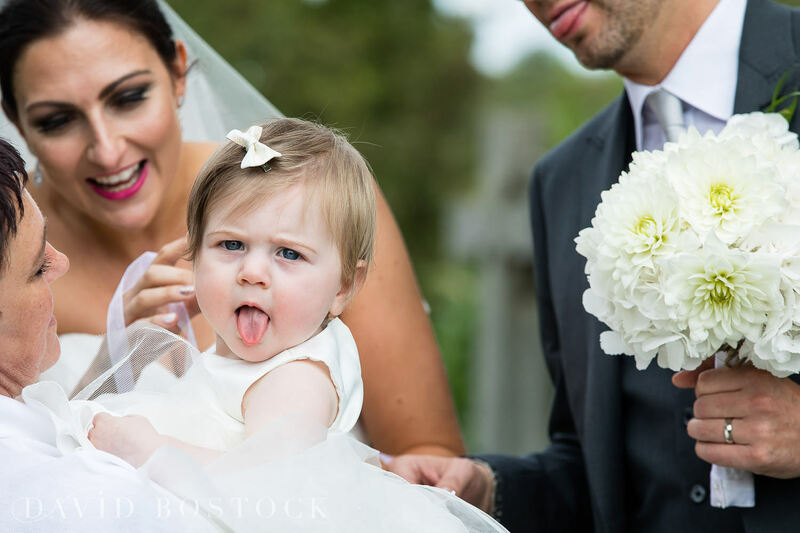 Beautifully captured.